Black Lives Matter comes to Rochester? What about "lying to investigators"? .....they're warming up for a gas of a night! Can't think of a better way to applaud Hilliary's big speech. ....about how prosecutors were forced to abandon trials of officers involved in the death of Freddie Gray. She argues that the problem was "reluctance" and "an obvious bias" on the part of officers investigating, but the fact remains that four consecutive acquittals were issued in a world where prosecutors win about 90% of the cases they bring to court. In other words, Mosby and her team took cases to court when they knew they didn't have the evidence to convict, and the officers involved are exactly right to sue her for filing false charges. If indeed she knew (as she appears to have known) that the case was weak, but brought charges anyways, she should suffer the same fate as Mike Nifong. Like Nifong, she withheld evidence as well from the defense. What needs to happen? Well, we can start with making it very clear that criminals need to be belted when transported, and then continue by putting cameras and accelerometers in the vehicles to measure how rough the ride really is. Moreover, as defense attorney Ivan Bates noted, if the police investigation is suspected of downplaying the reality, the state attorney's office did indeed have the right to investigate as well-but did not. And, if Carolyn Mosby indeed has played the Nifong, she needs to suffer the Nifong, too. Putting six men and their families through Hell for her political ambitions deserves punishment. ....from Donald Trump, calling on Russia to provide Hilliary Clinton's missing emails, and of course the Democrats don't get the joke. It is as if their chosen comics, people like Sarah Silverman and Michael Moore, have given up the feather for a bludgeon decades ago. Liberals, when your party's sense of humor makes Donald Trump's look subtle in comparison, you've got some big, big problems. And when you fail to figure out that the Russians almost certainly do have those 30,000 + emails, and will use them when it suits their purposes, you're trying to make even bigger problems for the rest of us. ...cigars, believe it or not, according to the Mises Institute. Now we can legitimately debate how much good FDA and other regulative agencies do, or what harm they do, but I would hope that we could at least agree that tobacco is neither a food nor a drug that would ordinarily be subject to the FDA's authority, and of course the whole point of lighting up a stogie is to do something unhealthful. What we have here, really, is regulators trying to put the kibosh on a lawful business without the consent of Congress, yet another clear violation of Article 1--I presume at the encouragement of the President. A while back, I blogged about the odd case of prosecutors choosing to, among other things, indict investigators of Planned Parenthood for violations of Texas law prohibiting tampering with government records for possessing a fake California drivers' license. Yesterday, a judge decided to dismiss all charges, but not for the reasons that one would guess. The reason was that the grand jury's term had been extended, but Texas law does not allow grand juries much latitude in issuing indictments during a holdover period. This is, of course, a protection against the very kind of "fishing expeditions" that seemed to be the case with the prosecutor's indictments in the first place, and issuing the indictments was thus a basic error by the prosecutor that was allowed by another basic error by the judge. This is good news, and I hope that someone goes a step further and asks what was going on that the fishing expedition was allowed in the first place, and whether Texas law really prohibits investigative journalists from hiding their true identities, and whether Devon Anderson's office consistently prosecutes allegations of fake IDs to begin with. To put it mildly, she should be asking others "is the AC working? It's getting warm in here." Not quite Mike Nifong, but worth a look. And the Fox News article on the dismissal gives a hint that David Daleiden's attorneys may be thinking about the same thing. Stay tuned; this could be an interesting ride. Apparently an Iowa football player had something of a near-death experience as police approached him while he was distracted playing "Pokémon Go". Apparently they thought he might be a man who had recently robbed a bank, and due to the headphones, the young man did not hear to comply with the police. If any of the officers were wearing body cameras at the time--it's possible but not definite--it seems like a great chance to take a very good look at the footage and see what might be done to improve how the police apprehend criminals. If I were the police chief, my request would be this: "Ladies & Gentlemen, it looks like this young man dodged a bullet, and so did we. Let's do what we can to make the next time less likely to be eventful." Glad you're OK, Faith, and have a great season, especially on November 12. Make it your own personal "Weasel Stomping Day". Secretary of State John "Effing" Kerry has made the claim that air conditioning is as big a hazard as is ISIS....OK, Secretary, lead by example. I want to see video of the crews you hire to remove the air conditioning from all your homes and where you work. And while you're at it, why don't you downsize to a 2400 square foot home like the rest of us inhabit, sell the yacht, fly coach, and the like. After all, if you really believed what you were saying, this is what you would do. Or do you not care that you're doing hundreds of times (thousands?) of times more damage to the environment than the average American? ...but give the IOC credit; they appear to be finally laying down the law on performance enhancing drugs and the nations that use them to improve their standing in the Olympics; Russia's track and field team is banned from Rio. Well, at least a golf clap for them; the great reason, of course, that the Olympics have been a bastion for hyper-nationalist nonsense for a long, long time is that Olympic qualification is not a matter of being one of the best in the world, but rather being the best in your country. Not surprisingly, countries used and manipulated the rules for their own purposes, and thus the floodgates were opened to enormous amounts of time, effort, and money to "win the medal count." Hang those incentives in front of nations and athletes, and we ought not be surprised that so many cheat. Maybe, just maybe, the IOC needs to re-read de Coubertin's thoughts on the matter and change some things. Sort of. There was a march--I was on the parade route at Dunkin' Donuts while it went by--and the first really interesting thing was that when I looked for a guy I'd met--about 6'4" and of robust girth, easy to spot--he wasn't there, but a young lady from my church was. Sure enough, when I looked up the Facebook page of the local black Baptist church, they were telling members and attendees not to go. So apparently there are at least two BLM movements in our city. What the differences are, I'm not sure, but there is a rivalry. What were they saying? Well, about the worst it got was "no more racist cops", a sentiment with which I agree, but it's unclear to me how much racism goes on here--let's just say that some of the best patients at Mayo are non-whites who fly halfway around the world to get here. If there were a large number of DWB citations or worse, City Hall would be hearing about it. So what does BLM believe? Well, with the obvious caveats that there about there being two such movements (just as Dr. King headed one, and Malcolm X headed another back in the 1960s) at least, and not every adherent believes everything, a few things of note are that the rights of LGTB.... seem to be about as important to them as the rights of blacks, that they're trying to end mass incarceration of blacks (really everyone), and they specifically note that they're committed to disrupting the "western prescribed nuclear family." In other words, it's exactly what one would predict if we assumed that the center of the black civil rights movement had migrated away from the church (at least the orthodox churches) and found itself in a secular, or at least UCC, position, which anyone watching Jesse Jackson and Al Sharpton over the past 35 years (e.g. myself) would have guessed. The biggest problem here is not that some marches talk about "dead pigs", though that is a nasty reality in places. The far bigger deal is the question of their agenda, in particular by weakening nuclear families and getting criminals out of jail. Now don't get me wrong; I love my extended family and community, and benefit greatly from them. But that said, extended family and community builds on the nuclear family and its economic and other provisions--so really, you cannot move to a "community" model a la Hilliary Clinton's It takes a Village if the nuclear family is broken, and quite frankly, the inner city demonstrates this in a horrific way, as Sen. Moynihan noted in 1965. In the same way, extended family and community, not to mention protection of LGBTQ.... rights, depends greatly on whether anti-social and criminal elements can be rehabilitated or removed--and for the most part, that means churches rehabilitate and the state jails criminals. How's it working out for you? It's been tried in your community for over half a century. ....is the Babylon Bee's joke that President Obama has nominated the Canaanite fertility "god" Molech to the Supreme Court because no other conveyed the deep desire to slaughter infants that is a hallmark of the Obama presidency. Allowing the self-identified "transgender" to use the bathroom of their choice opens up the ladies' room to those who should be on Megan's List. Also, as if urban blacks did not have enough problems already, white liberals appear to be working to create more by blocking I-35 in Minneapolis. About 90% of the protesters that have been arrested appear to be no more black than myself. "Thanks, guys, but....can you just go back to your coffee shop and do some good for society instead of getting us blamed for everything? Thanks!" 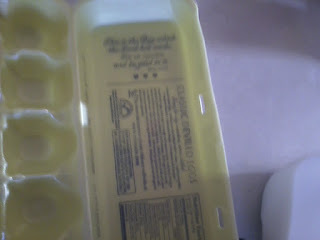 It's a little blurry, but the italics are "This is the day which the Lord has made, we will rejoice and be glad in it", and the recipe is for "Classic Deviled Eggs." Apropos nothing. Evidently some actress named Lena Dunham has come out strongly against "cultural appropriation", one example being her alma mater's (Oberlin College) serving sushi in dining halls. Now while I have any number of reasons to get pretty scared of the idea of dining hall sushi, starting with food safety, I've got to say that you can count me 100% in favor of cultural appropriation. Where would our food be without "cultural appropriations" like coffee, soul food, noodles, rice, maize, potatoes, chocolate, cured meats, pasta, European breads, tea, various types of liquors, and the like? For that matter, what would our music be without appropriated music like jazz, blues, opera, bluegrass, and more, or our literature without appropriations of various poetic and stylistic forms like the sonnet, regular meter, and such? Where would our technology be without the contributions of other societies? We would be, of course, back in the stone age right after the scattering at the Tower of Babel. And having learned a bit about life in the stone age--where the C-section that delivered me and the intussusception surgery that saved my life were not yet culturally appropriated--count me out. I'm all in favor of cultural appropriation, even if people make some mistakes in doing so. ....that I've done business with stores because I saw they were willing to hire the disabled. Your move, Wal-Mart. ....I don't presume to speak for the families of the Dallas officers killed and maimed by the shooter last night, but I wouldn't be surprised if some of them had a decidedly unprintable view of Governor Dayton and President Obama for their public statements claiming institutional racism was definitely in play--and that before the body was even cold or the investigation really got going. I know my response to Governor Dayton and President Obama in this regard is this: thanks, idiots. And for those who have intimidated police into not proactively dealing with signs of crime: thanks, idiots. If we want to act as if black lives matter--and emphatically they do--that starts with dealing with and prosecuting real crimes, no matter who the perpetrator is. It starts with respecting the process of investigation and not flying off the handle with your own pet theories. Yes, I'm talking to you, Mr. Comey and Mrs. Lynch. Yes, I'm talking to you, Mr. Dayton and Mr. Obama. Here in Minnesota, something that's worth noting is that apparently at least 20 Somalis living here in Minnesota--refugee, resident alien, or citizen--have either gone to the Middle East to be terrorists (some having killed and been killed themselves), or have been arrested trying to do the same. Of course, this is a big concern with any refugee program; refugees, after all, arrive on our shores because their government either is trying to kill them, or their government fails to protect them against those who would kill them. Hence, you cannot really do a decent background check on a refugee--that's why historically we've had "refugee camps" where we watched their behavior to determine who will be allowed in, and who will not. No great shakes in terms of lifestyle, but it beats where they came from. Now in terms of Minnesota, the state is said to have about 25000 residents of Somali descent, so that would seem to be a significant level of terrorism--about a 0.1% "participation rate." That said, we're not done yet. All of the convicted, and deceased, happen to be young men. So we have 20 of about 12000 men, and 20 out of probably about 2-3000 young men; in other words, at least 1%. Add to that people who have "participated" but not been detected, and we're getting to what I'd call a fairly unacceptable rate of this group participating in terrorism--and what happens if and when they figure out that some U.S. targets are "soft"? I don't want to send all these people back to where they came from, but we seriously need to do a better job monitoring refugees and teaching them about our society. In ignoring the clear meaning of 18 USC 1924, but repeatedly stating that Mrs. Clinton lied on more or less every significant point in the investigation, one must wonder why James Comey didn't bring "lying to investigators" charges on Mrs. Clinton. Of course, the reason is the same reason that Comey's boss didn't allow a real investigation of IRS abuses. It's been all to convenient for President Obama, really, and if he allowed prosecution of people whose "mistakes" benefited him, they would of course suddenly develop a great memory for who had told them to make those mistakes. Update: the Babylon Bee is apparently abandoning satire here on this topic, as Mrs. Clinton lied to a judge about providing all work-related emails (that's perjury) and obstructed justice by deleting files on her server and burning her meeting schedules. She's in good company with her husband in that regard, sad to say. Comey needs to be disbarred for this one, as it's clear abdication of responsibility going well beyond mere prosecutorial discretion. ....is the sad fate of a man using this feature on his Tesla Model S, as the software failed to detect a semi in his path--suffice it to say it will probably be a closed casket funeral, to put it mildly. At this point, it is one fatality in 130 million miles, and that fatality rate ( 7 deaths per billion vehicle miles) is comparable to the overall vehicular fatality rate of ten fatalities per billion vehicle miles. While the confidence range is huge with n=1, and Tesla and others will certainly improve their image recognition software as a result, it's still troubling, even with the company's explanation and promise. The fact of the matter is that the key drivers of accidents--alcohol and fatigue--were obviously not involved (at least on the autopilot side), and hence we'd infer that this fatality rate is actually fairly high versus that of sober, attentive drivers. This illustrates a big weakness with vehicular autopilot systems; the key driver of vehicle safety, really, is the proverbial "nut behind the wheel", and autopilot allows that nut, as it were, to come loose a bit. Count me out of efforts to rush this to market.